Power, speed and agility all have their place in sports, there is power in a hockey stride or jumping in basketball, there is speed required for running the bases in baseball and sprints on a track, there is agility for running routes in football or for controlling the ball while running/sprinting in soccer. As you can see these 3 athletic attributes are apparent through almost every sport, and no single one of them can be accomplished optimally without the other. Let’s look at these different athletic attributes more closely below and find out how they all relate to each other and how to train for them most affectively. Power is where the base of all athleticism occurs in my opinion, you need it to move explosively off the start and throughout sprints for speed, be ready to shift in different directions for agility, and even your strength wouldn’t be used to it’s fullest without being able to use it explosively. Weighted Descent & Bodyweight Ascent – This is when you use weight on the decent of a movement then release the weight at the bottom and you then explode up on the ascent part of the lift (e.g. using kettlebells when you load up for a box jump, drop them and then perform the box jump with just your bodyweight), I find these to be extremely helpful with generating power because your body is controlling a weight when all of a sudden it drops and you explode up with just your bodyweight, I also find these to be extremely good at working on quick explosiveness. Speed is very important for a wide variety of sports, therefore incorporating this into your training is huge. Speed has carry over to all 3 athletic attributes in the sense of in order to train for power you need to train with speed, and to train for agility you need to be able to move with speed in all directions. As you can see I used shorter distances as I was training for hockey and I wouldn’t be going full out very often for more then 30 metres at a time without stopping, slowing down or turning. Now I am not saying I couldn’t have added longer sprint distances, that probably would’ve been a good idea to add some variety. There is always room for improvement. If you want to use something like this, you can tailer the distances and use different starting positions to gear it towards what you are training for as well as to add more relevancy and variety. Agility is a very important and often over looked part of sports and training for sports, especially for ones that require heavy footwork and quick changing of direction, such as, hockey, football, soccer, etc. As I said before all 3 of these athletic attributes are tightly correlated, as for agility goes it can be great for coordination for power training (especially with plyometrics when your not always in contact with the ground or weight your moving). For speed, it can be great for quick starts and coordination as well as opening the door for different varieties of speed training such as changing direction with quick stops and starts. 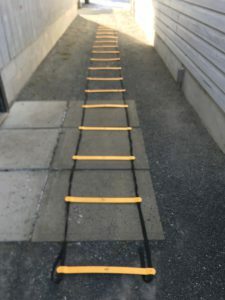 A great tool that I have used a ton for agility was an agility latter, it is extremely helpful for foot speed and coordination (the 2 main pillars of agility). Here is an example workout which has all the exercises being ones I’ve used myself! Please refer to this video to see how to perform each of the movements: https://www.youtube.com/watch?v=iICTuTZCJyM. I have included time stamps beside each of the numbers so you know where the exercises appear during this video. I would suggest performing 3-5 rounds of this (3 if starting out and progressing to 5 as you advance). I usually take 1-2 minutes of rest between rounds to ensure you are recovered so you can perform optimally during all rounds. I like to start of my agility workouts with an easy drill to get my legs going as well as get my foot speed and coordination warmed up, in this case it was the forward sprint. I then like to include a simultaneous 2 foot movement drill to work on stability and start getting into the side to side movements. I included the lateral scissor hops and icky shuffle for numbers 3 and 4 to start working on quick single foot coordination as well as foot speed. I included the lateral high knees for the same reasons as numbers 3 and 4 but to work on them in a different direction, lateral in this case. I used the lateral in and out for number 6 because I always like to finish the round of on a very quick foot speed and a high need for coordination movement, this also allowed for a third lateral movement. It is very important to be training in different directions. This because in an actual game you will almost never be moving in only one direction, I will be including more detail on this in my future articles. Please ensure you learn how to perform all movements/exercises (in my article or not) safely, this will help to reduce the risk of injury. I hope this article was able to give you a good fundamental understanding of how to train for sports! I wish you luck on applying this information to your own training and hope that it helps you improve! As always, if you have any questions or comments please don’t hesitate to post them below and I will be sure to respond! Hi there and thanks for writing this comprehensive article on the fundamentals of training for sports. 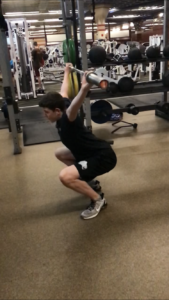 Your writing makes it very clear what you need to do i.e., improve power, speed and agility as well as ways to do that using plyometrics, weighted descent and body weight ascent and powerful flow movements. I am passing this information on to my son to read up on for his football training. It might just help to give him an edge for the season. I am very glad you found the article helpful, I hope your son does as well! Also, please ensure your son learns how to do the different movements (whether it be ones in my article or not) properly so he is training training safely and therefore helping to reduce the risk of injury. Thanks for the education. I didn’t know that the agility drill that’s done on the ladder was called the Icky Shuffle. As far as I knew, the Icky Shuffle was the end zone celebration that Cincinnati Bengals back Icky Woods used to perform, after scoring–here he is demonstrating how it goes; it’s a little more basic than what is done on the ladder. I’m curious: do you think that cardiovascular ability is partly attributed to nature (how we’re made) and not just nurture (how we train)? I remember doing wind sprints, when I was younger, and would get so winded that it hurt. My son, meanwhile, would go through an entire football practice, which was held late in the day, and he would still want to run around with his friends after everyone else had left the practice field. Anyway, great post. Thanks for posting. Hi Kevin, I guess there is 2 versions of the icky shuffle, haha. As for your question, in short, yes genes do play a role in your cardio ability for a variety of different reasons. I haven’t done too much research on this before, therefore I don’t know all the detail. I will link an article from a different website which will give you some more insight. Here it is: https://vitals.lifehacker.com/….